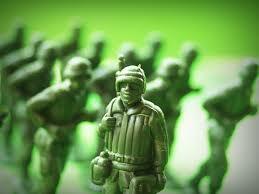 Most members of the hobby miniatures community often ask about painting plastic toy soldier miniatures. There are various answers and solutions that can benefit those whether they are experienced or just joining the hobby. Here are several techniques, practices, and approaches that can work. There are figures that have an extra volume of plastic that can inhibit the painting process. Be sure to remove them, this will already make your painting job significantly easier. To wash the figures, some hobbyists find that an old toothbrush and cup of dish detergent can work well. Rinse the materials thoroughly and allow them to fully dry – overnight is the most recommended. A big step in improving your painting result is to wash the figures well. This will better allow the paint to adhere to the figures. During the miniature manufacturing process, the mold can become coated with a non-adhesive release agent which presents the plastic from sticking to the mold. The release agent will then get transferred to the figures. A strong coat of primer can simply improve the paint bonding process. Another value it has is that it can allow you to use only one coat of paint. With lower-strength primers, it may be necessary to apply multiple coats. The primer will then be applied consistently throughout the entire figure. This can be a trickier process than it seems, so a spray primer can work as well. You can line up one hundred individual soldiers on a plywood board, then spray an even coat to all of the figures. After you have sprayed the figures standing up, you can set them on their backs or fronts to spray the remaining sides. With the priming process finished, you can review your brushes for quality and conditioning. You may want about three brushes, a large one, a small one, and a fine brush. The large brush can work for large space coverage, including painting a base uniform color or terrain color. A small brush can be used for small details such as boots, packs, and weapons. A fine brush can be used to paint thin features such as backpack straps or parachute lines. Smaller brushes requiring better condition. If there are even one or two hairs out of place, it can increase the potential for mistakes or paint landing in unintended areas. Rinse your brushes as need during work and clean them well once you are finished for the day. Water-soluble/acrylic paints work well as they are easier to clean up and do not create the need to work in ventilated areas. This is good if you are painting during the winter. Another important consideration is the consistency of the paint. Be sure your paint has not thickened where it starts to affect the performance of your brush. Thick paint can cause the brush to become fat and increase the chances of mistakes. You will need to thin the paint to ensure your brush can work in stable condition. You can use water to thin the paints, but some brands also have their own specific thinners. As you move on to the weapons and equipment, you can use a smaller or finer brush. For comfort, using a big brush to paint your surface quickly can be effective and time-efficient. Another rule of thumb is to paint as much detail as you can see when holding the figure at arm’s length. This is the standard perspective of any model that is actually on display either during a tabletop game or as a diorama. This approach may be different if you are planning to shoot zoomed in photos of the figures. In that case, you may paint more details as necessary. After the painting process, your figure is close to looking great. Be sure to review your work for any missing details. In addition, avoid using them immediately for gaming until they fully dry. You can apply an additional protective finish the ensure longevity of the results. A coat or two of liquid rubber can work, this allows some parts of the model to withstand bending without the paint cracking or being rubbed off.